In early Fall 2010 we found we needed some extra space in a pinch for two bantam cockerels. We knew they would probably be here all winter, and both were "special needs" birds who were each blinded in one eye so I did not want them with my larger flock. We decided to create a modified version of the mini coop with slightly less interior space that would need to be heated, so the coop space we subtracted was made into a "sun porch" leading to the coop ramp. The porch would provide much-need ventilation next summer without the need to close the pop door. Like the mini coop, the bachelor condo would be 4' wide and 30" (2 feet, 6 inches) deep. The porch was around 18", leaving the coop space 30" x 30" - - quite sufficient for two bantam gentlemen to snuggle into for winter. 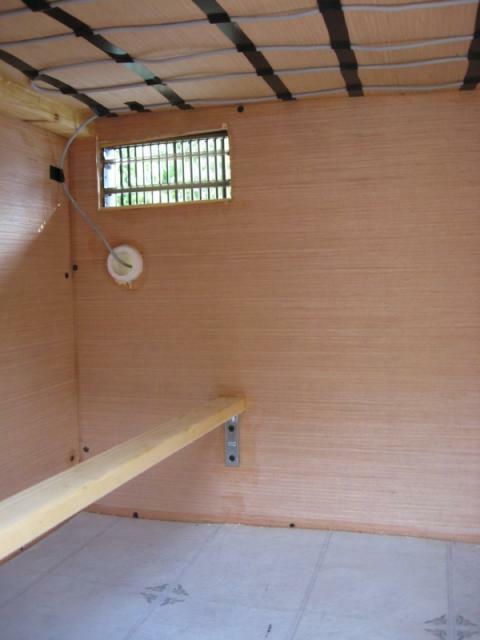 Again like the mini coop, we used a 3-layer wall with an exterior of pine bead board, a layer of 1/2" foil-backed foam insulation, and more leftover boatmaker's veneer for the interior walls. The exterior bead board was treated with a layer of clear Thompson's Water Seal. 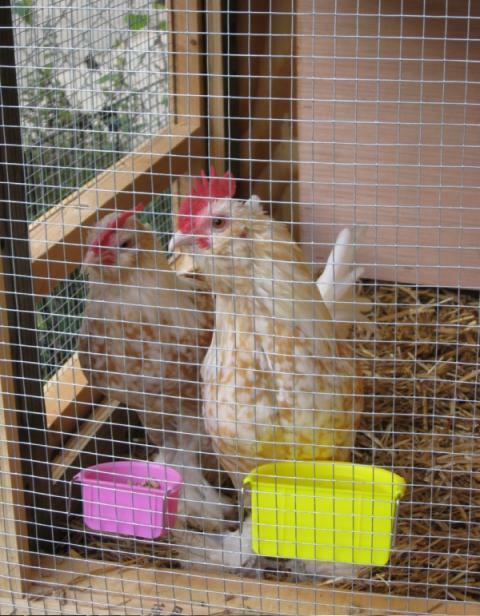 The coop has been created to stand beneath a tinted polycarbonate roof which also covers the 4 x 8 pen. There was no real need for a pitched roof, then, so I simply covered the pine board with a quick layer of vinyl flooring for water proofing and ease of cleaning on top. I sealed the edges with clear caulk to be on the safe side. We used leftover vinyl flooring for the coop and porch floors as well, and I was careful to seal up all nooks and crannies with clear exterior-grade caulk. I can't stress this enough for preventing water leaks AND preventing the spread of poultry mites who love to live in cracks. We used a small floor register as the vent cover on the covered pen (south) side of the coop near the ceiling. Cross ventilation is provided by two smaller round vents that open to the covered patio, again near the ceiling. Below is a view of the "sun porch" and pop door; you can see part of the round vents at the top right. Because this small coop is near the patio and is easy to hook to electric, I chose to heat the coop ceiling with an 18' length of reptile heat rope from Big Apple Herp. When the ceiling piece was completed but not yet attached, we flipped it over and I used electrical tape to seal the heat rope to the ceiling. 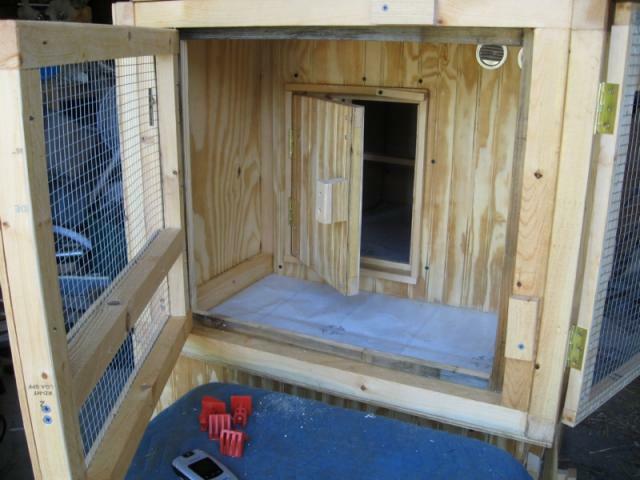 I tested it to make sure it all worked, and then we flipped the roof over and fitted it onto the coop before sealing the edges with caulk. The heat rope is quite safe, and makes things very toasty in the coop so it will not be used until it gets much colder outside. Above is the coop interior from the rear (north side) access door. We used a small piece of PVC for the heat rope exit, and have a very small opening at the other end for the wire to come out. The boys have now moved into their new condo, and they are safe and cozy in their new winter quarters. More pictures to come soon, since we have also finished the covered pen and the ramp. This could be used for multiple purposes in a backyard flock. 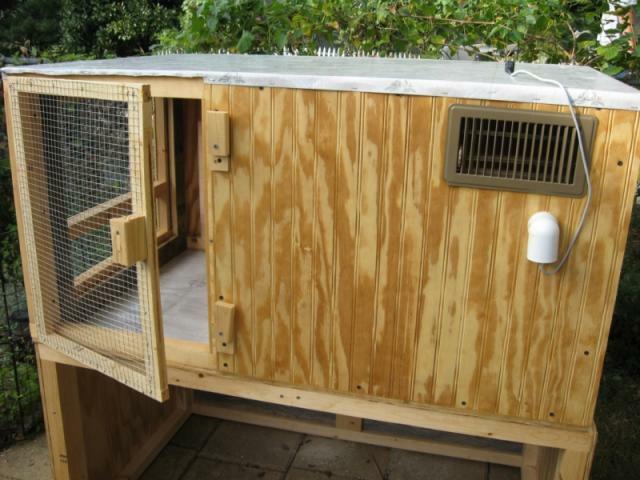 Would work great for a brooder and a momma nursery, Thanks for sharing. I wouldn't put the heat in it though. Most dont need the heat, they produce their own heat. I always give cracked corn or scratch in th winter to help with with that. Ho does the heat cord work in cold times? I love your little bachelor condo! 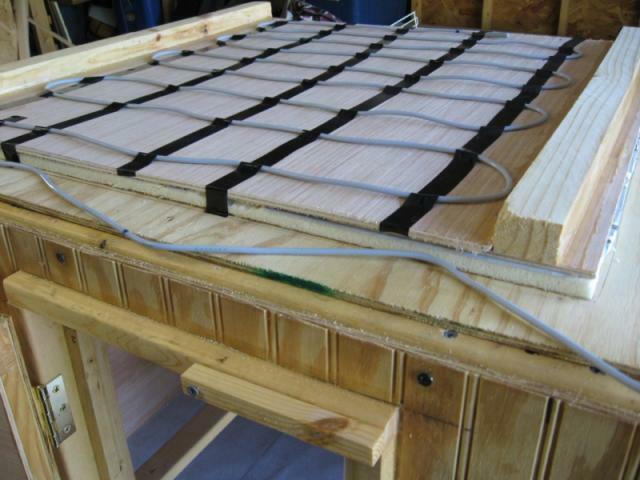 Did you have to use plywood to build the sides before attaching bead board, or were you able to just straight up use the beadboard alone?